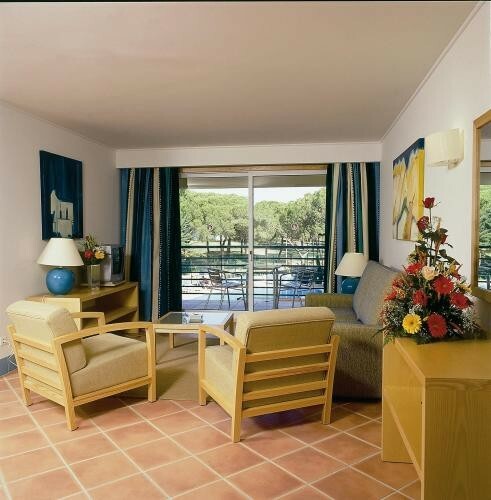 Located in pine tree area with landscaped gardens - 185 Studios, One-Bedroom and Two-Bedrooms holiday furnished - pools, courtesy bus to beach, Discounts for Online Booking. 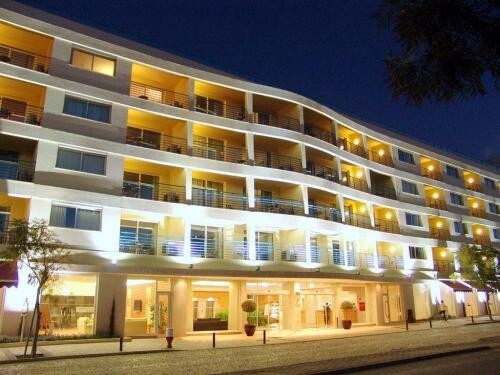 The Hotel Alpinus Falésia Suítes Apartments is located in the pine tree area near to Falésia beach and to the east of Albufeira in the Algarve. There are 185 apartments divided into Studios, One Bedroom and Two Bedrooms. Each apartment has an equipped kitchenette, double or twin beds. Set back from the beach but it is still within walking distance and these apartments provide a good family holiday complex to enjoy the sun, beach, and self-catering. There is a Kids Club and playground with a Courtesy Bus to the beach. Two outdoor pools set in landscaped garden, one for children, a restaurant and a bar, a solarium, a garage and a parking area in front of the hotel. Includes a kitchenette and a balcony. This apartment consists of 1 bedroom, a living room with sofa bed, a kitchenette and a balcony. Please note this apartment can accommodate 2 Adults and 2 Children up to 13. Children up to 13 years are free for the All Inclusive offer. Consists of a bedroom with pool view, a living room with sofa bed, kitchenette and balcony. This apartment consists of 1 bedroom, a living room with sofa bed, a kitchenette and a balcony. This apartment consists of 1 bedroom, a living room with sofa bed, a kitchenette and a balcony. Please note this apartment can accommodate 2 Adults and 1 Child up to 13. Children up to 13 years are free for the All Inclusive offer. This apartment consists of 2 bedrooms, a living room with sofa bed, a kitchen and a balcony. Please note this apartment can accommodate 4 Adults and 2 Children up to 13. Children up to 13 years are free for the All Inclusive offer. This apartment consists of 2 bedrooms, a living room with sofa bed, a kitchen and a balcony. Consists of 2 bedrooms with pool view, a living room with sofa bed, kitchenette and balcony.